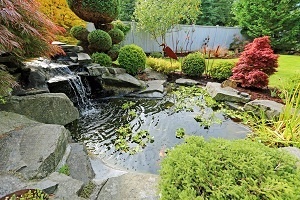 A water garden can be an ornamental addition to your yard. It’s beautiful to look at, and it’s also calming to relax and watch the fish. Unfortunately, it’s not enough to just have your water garden in Johns Creek installed. You can’t set it and forget it. Anytime you’re dealing with plants or animals, there is some maintenance involved, even if that maintenance is fairly minimal. But don’t worry—maintaining a pond is not difficult. As long as you change out the water, control the growth of algae, and use a pond liner, you should be fine. It’s a good idea to change the water in your pond frequently. You can change about 10 percent of the water volume once a week. However, it might be easier to change about 40 percent of the pond water once a month. If you’re connected to a municipal water system, you must be careful. The chlorine that’s present in your tap water isn’t good for your pond, because chlorine harms the natural balance of the compounds inside your pool. It’s best if you can aerate, filter, or treat the water to remove chlorine before adding it to the pond. With small ponds, algae growth is a concern. Unfortunately, algae compete with other plants and fish for the oxygen in the water. Besides, algae plants are not as picturesque as seeing the plants you put in the pond or your fish. One way to reduce the growth of algae is to reduce the amount of light in your pool. You can do this by planting rooted, shady plants inside the pond. They’ll absorb some of the nutrients that algae would otherwise use. Unfortunately, shady plants make it a little more difficult to see the fish, but the shade is precisely what’s keeping algae away. You can also use chemicals to darken the water. With a pond, you’re concerned that runoff from your lawn gets into the pond. Fertilizer and weed killer may help your lawn, but it’s not good for the plants and fish in your water feature. Similarly, you don’t want the nutrients from the pond to leak onto your lawn, because they’re needed for the fish and plants. It’s a good idea to use a pond liner to separate the pond from the surrounding soil. 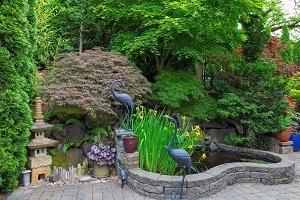 You can also plant some ornamental shrubs around your pond to soak up those nutrients. It’s important to change out the pond liner at least once every summer. This will get rid of wastes and any other materials that build up on the bottom of your pond.